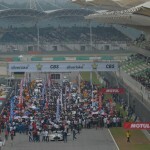 At 4:00 in the afternoon in tropical Sepang, the sun was still high in the sky but owing perhaps to the later start than in past years, the air temperature of 33 degrees C. and 42-degree track surface temperature actually felt cool in comparison to the usual Sepang heat as the 54-lap race was about to begin. After the formation lap, it was the pole-starting No. 12 CALSONIC IMPUL GT-R (Tsugio Matsuda) that dashed into the lead at the start to get the hole shot. Following Matsuda into the first turn came the No. 38 ZENT CERUMO SC430 (Kohei Hirate), the No. 37 KeePer TOM'S SC430 (Andrea Caldarelli) and, coming up from the outside, the No. 1 REITO MOLA GT-R (Yuhi Sekiguchi) moved into 4th position. Behind them came the No. 39 DENSO KOBELCO SC430 (Hiroaki Ishiura) and the No. 100 RAYBRIG HSV-010 (Takuya Izawa). Although it had secured the lead, the No. 12 CALSONIC IMPUL GT-R was having trouble opening up any considerable margin of lead, being challenged already by the No. 38 ZENT CERUMO SC430 on the first lap. Running lap times within tenths of a second of each other the two machines were locked in a battle so close that at one point on lap four the ZENT CERUMO SC430 hit the rear of the CALSONIC IMPUL GT-R. Behind this battle for the lead, the No. 1 REITO MOLA GT-R passed the No. 37 KeePer TOM'S SC430 on the ninth turn of lap five to move into 3rd position and was soon closing in on the No. 38 ZENT CERUMO SC430. On the 14th turn of lap six Sekiguchi tried to slip in to a slight opening on Hirate’s inside but the two machines hit each other, causing the ZENT CERUMO SC430 to spin out and drop from 2nd to 12th place. The REITO MOLA GT-R also dropped back to 5th position, but the damage from this collision caused a burst of the right rear tire of the ZENT CERUMO SC430 on the eighth lap that sent it back to the pit. These accidents sent a number of the top contenders out of the competition early in the race. At this point in the race the top three were the No. 12 CALSONIC IMPUL GT-R, the No. 37 KeePer TOM'S SC430 and the No. 18 Weider Modulo HSV-010 (Naoki Yamamoto), but on lap nine the No. 18 Weider Modulo HSV-010 rose to 2nd position and began to close in on the CALSONIC IMPUL GT-R. The No. 12 CALSONIC IMPUL GT-R and the Weider Modulo HSV-010 were locked in a nose-to-tail race until the 14th turn of the 18th lap, when Yamamoto found a gap and moved in on Matsuda’s inside. The two machines were then ran side-by-side through to the last turn before the No.18 Weider Modulo HSV-010 finally took the lead. Once in the lead the Weider Modulo HSV-010 quickly opened up a lead of about five seconds. 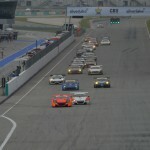 While this action was taking place at the front, the race entered its middle stages and some teams began making their routine pit stops early, beginning with the No. 17 KEIHIN HSV-010 on lap 20, and the No. 6 ENEOS SUSTINA SC430 and No. 19 WedsSport ADVAN SC430 on lap 21. Then, on the last turn of lap 22, while battling with the No. 100 RAYBRIG HSV-010 for 5th position, the No. 23 MOTUL AUTECH GT-R lost its balance and slipped, hitting the No. 1 REITO MOLA GT-R on the outside of the turn. This caused the REITO MOLA GT-R to spin out. For this collision, the MOTUL AUTECH GT-R was given a drive-through penalty that took it out of the competition among the leaders. Among the leaders, the No. 37 KeePer TOM'S SC430 running in 3rd position made its routine pit stop on lap 24, as did the No. 23 MOTUL AUTECH GT-R then in 6th position. On the next lap (25) the machines in second to fourth position, including the No. 12 CALSONIC IMPUL GT-R, the No. 39 DENSO KOBELCO SC430 and the No. 100 RAYBRIG HSV-010, all made their pit stops. The leading No. 18 Weider Modulo HSV-010, which had built up a more than 10-seconf margin and looked to be headed for a runaway victory, also made its pit stop on the following lap (26) along with the No. 36 PETRONAS TOM'S SC430 and No. 24 D'station ADVAN GT-R. But bad luck struck the leader as engine failed to start after the pit work was finished. By the time it finally started, the Weider Modulo HSV-010 had been in the pit for a costly 55 seconds. 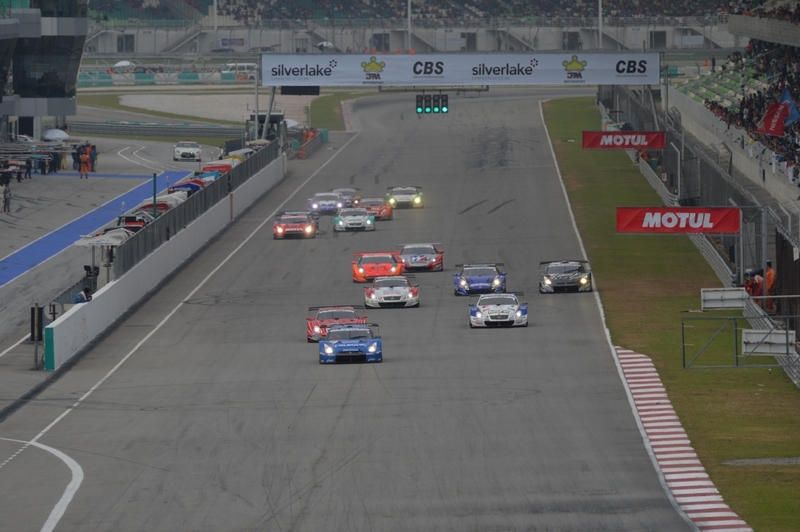 It returned to the race to find itself now in 7th position behind the leaders that had made their pit stops earlier. On the 27th lap it was also passed by the No. 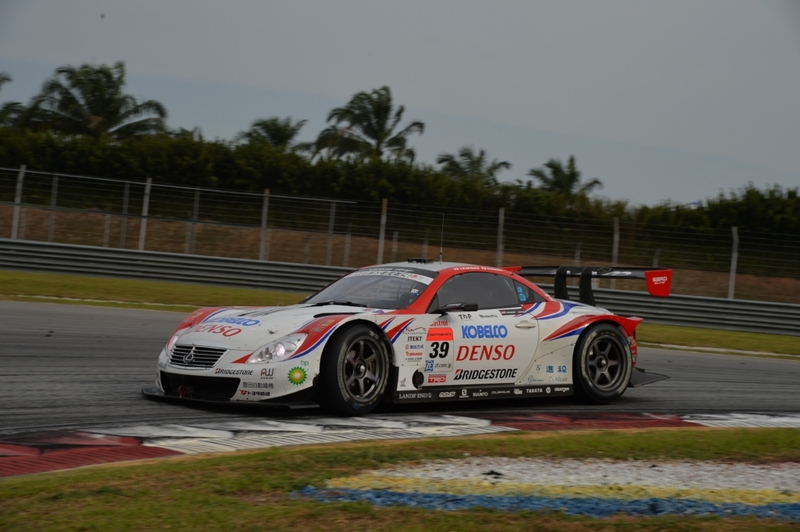 1 REITO MOLA GT-R (Satoshi Motoyama), dropping it to 8th position. These events put the No. 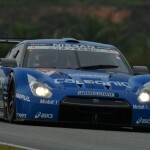 12 CALSONIC IMPUL GT-R back in the lead with the No. 39 DENSO KOBELCO SC430 2nd place and the No. 100 RAYBRIG HSV-010 now in 3rd position. Once second stint driver Frederic Makowiecki got the tires of his Weider Modulo HSV-010 warmed up, he began turning out 1’58 second laps and working his way back toward the leaders, while recording the fastest lap of the race in the process. By lap 29 Makowiecki was in 7th, on lap 30 he moved into 6th and then on lap 33 he took 5th position. Next, Makowiecki moved up on the tail of Daisuke Ito running in 4th position in the No. 37 KeePer TOM'S SC430, but the skilled racer Ito managed to hold off Makowiecki and stop him from any further advance through the field. In the latter stages of the race, the No. 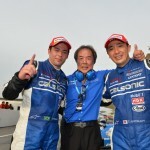 12 CALSONIC IMPUL GT-R held the lead while close battles were raging between the cars in 2nd to 5th position, but the order remained the same with no changes. 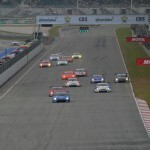 But on the last lap (54) a GT300 class car hit the No. 37 KeePer TOM'S SC430, causing it to run off the track and suffer damage to its suspension that made it fall back in position. This moved the No. 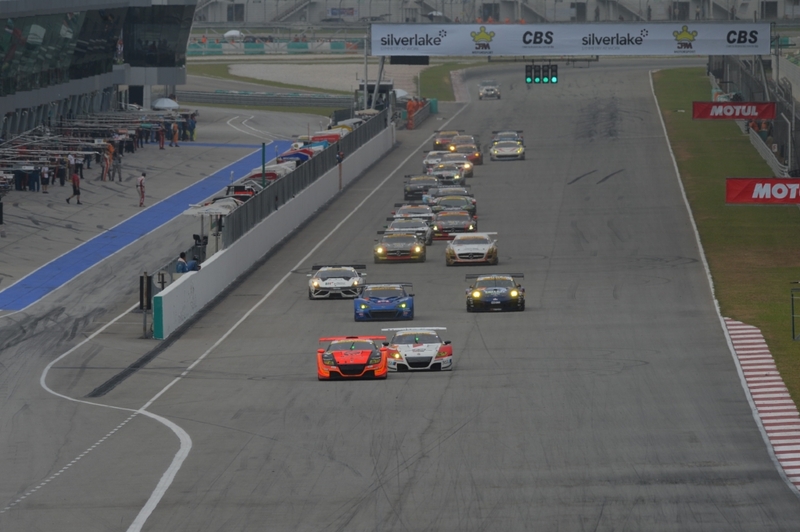 18 Weider Modulo HSV-010 up into 4th place finally and raised the finishing position of all the cars behind it. When all the racing was over, the No. 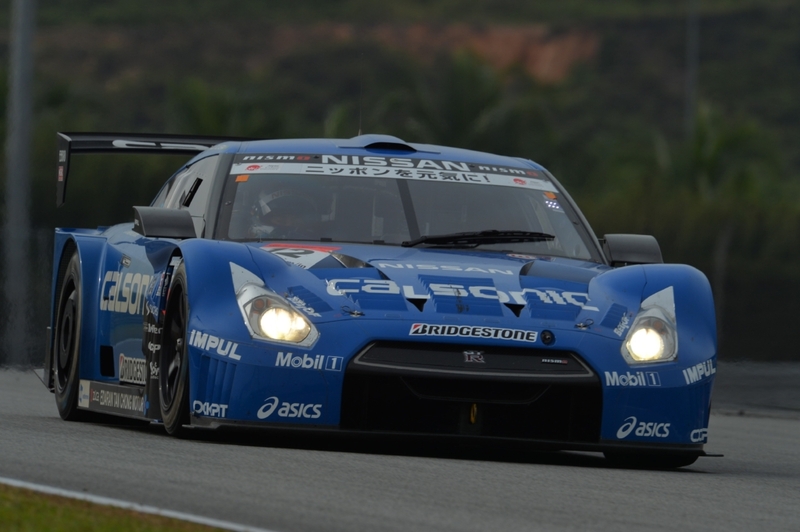 12 CALSONIC IMPUL GT-R had effectively gone from pole position to win the race; its first win of the season. The second and third spots on the winners podium went to the No. 39 DENSO KOBELCO SC430 and the No. 100 RAYBRIG HSV-010 respectively. The No. 18 Weider Modulo HSV-010 finished 4th, followed in order by the No. 17 KEIHIN HSV-010 and the No. 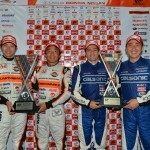 1 REITO MOLA GT-R.
By finishing 3rd, the No. 100 RAYBRIG HSV-010 driver team of Izawa and Takashi Kogure maintained their position at the top of the season standings, and this win moved the No. 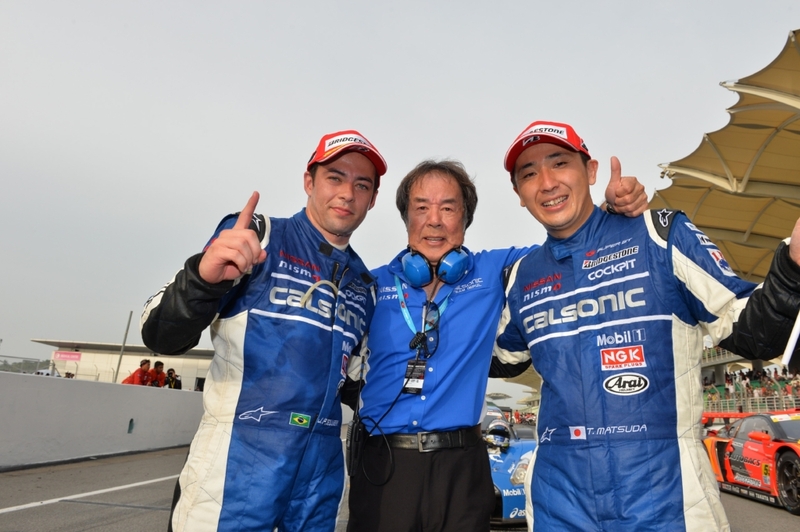 12 CALSONIC IMPUL GT-R driver pair of Matsuda and De Oliveira into 2nd place in the standings, while the No. 39 DENSO KOBELCO SC430 pair of Juichi Wakisaka and Ishiura moved up to 3rd position. 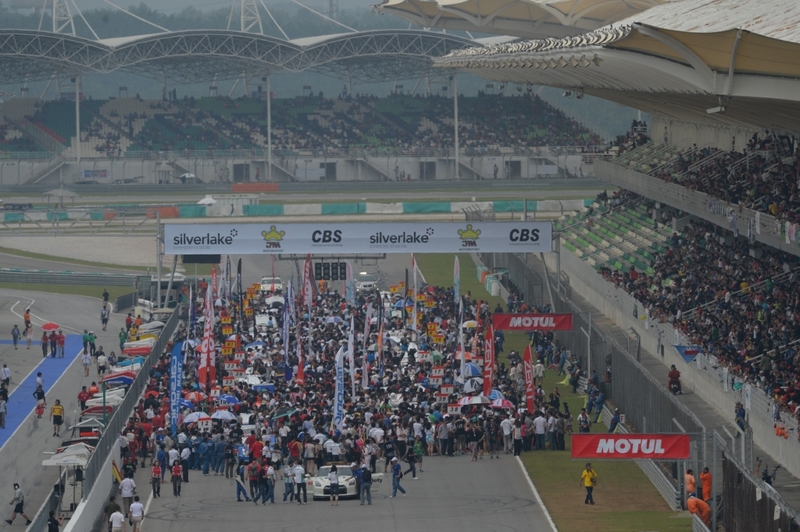 The start of the GT300 class race immediately turned into a fierce battle between the two CR-Z machines starting from the front row. The pole-starting No. 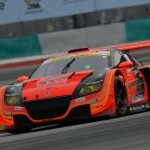 55 ARTA CR-Z GT (Shinichi Takagi) just barely led the 2nd-position starting No. 16 MUGEN CR-Z GT (Hideki Mutoh) through the first turn. It was a nose-to-tail battle for the next five laps or so before the ARTA CR-Z GT was able to open up about a 2-second margin of lead over the MUGEN CR-Z GT by the seventh lap. The 3rd-place qualifier, last year’s champion car, the No. 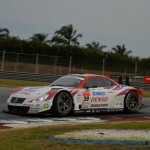 0 ENDLESS TAISAN PORSCHE (Naoki Yokomizo), got a bad start that dropped it to 5th position. While the defending champion car faltered in the early going, a close battle for third developed between the No. 88 ManePa LAMBORGHINI GT3 (Manabu Orido) and the No. 61 SUBARU BRZ R&D SPORT (Kota Sasaki). Meanwhile, the two CR-Z machines in front were pulling away from the pack to a lead of about six seconds over 3rd place. As for the No. 50 Exe Aston Martin that was forced to withdraw from the free practice, the team was able to recover enough to salvage a pit start and send driver Hideto Yasuoka into the race. The race took an unexpected turn during the routine pit stops. Running in 2nd position, the MUGEN CR-Z GT was the first car among the leaders to make its routine pit stop on lap 23. To save time, the Mugen team only changed the car’s rear tires. After just under 30 seconds of pit work, a speed comparable to the GT500 teams, the MUGEN CR-Z GT returned to the race with Yuhki Nakayama at the wheel. On the next lap, the leading ARTA CR-Z GT made its pit stop. 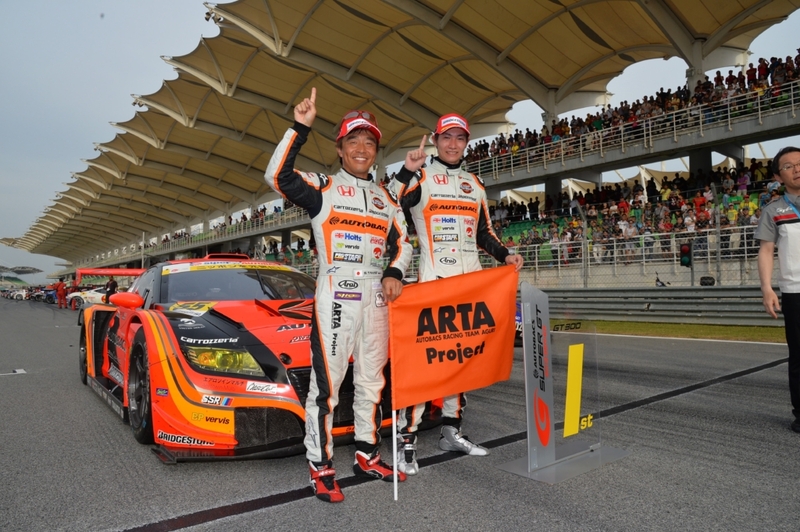 The ARTA team also opted to change only the rear tires, but its pit work still took eight seconds longer than the MUGEN team had. 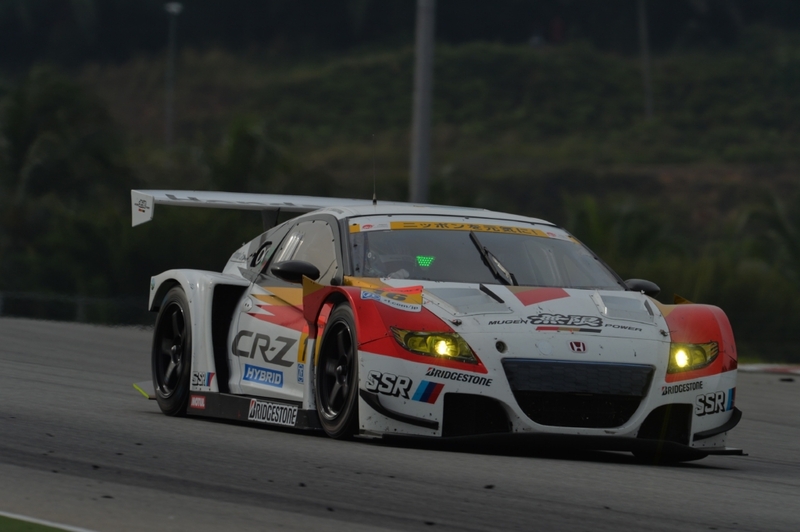 So, second stint driver Takashi Kobayashi found himself behind the MUGEN CR-Z GT when he got the ARTA back into the race. 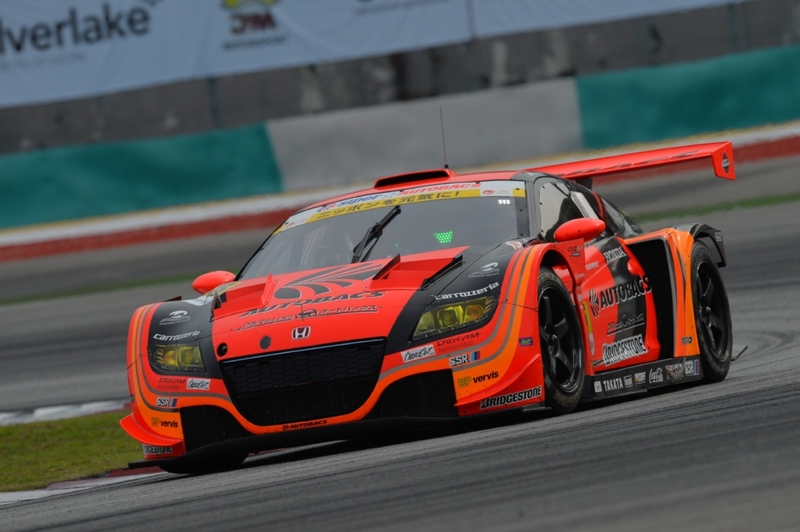 By the 29th lap, when all of the leading teams had finished their pit stops, the MUGEN CR-Z GT (Nakayama) was in the lead, four seconds ahead of the pursuing ARTA CR-Z GT (Takashi Kobayashi). Kobayashi gradually closed the gap with Nakayama in front. By lap 37 Kobayashi finally had his car’s nose on Nakayama’s tail and stayed there until the first turn of lap 41, where Kobayashi succeeded in passing Nakayama. 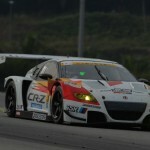 This put the ARTA CR-Z GT in the lead again. 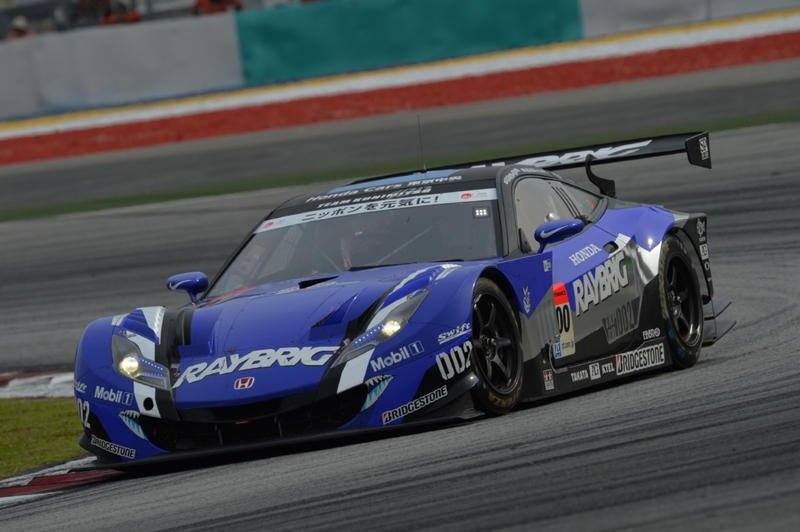 In the closing stages of the race, Kobayashi maintained his pace and kept a two to three second margin of lead over Nakayama. 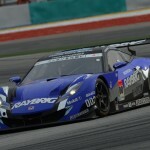 The lead held to the finish, giving the CR-Z and Kobayashi himself their first SUPER GT victory. 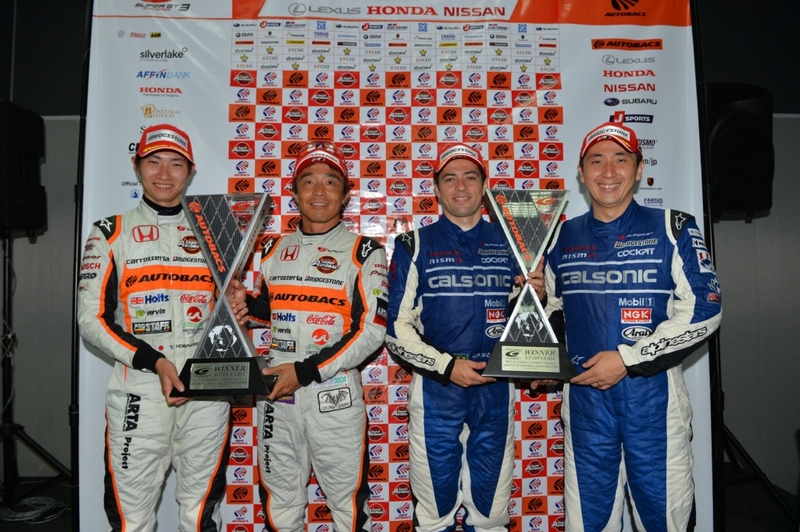 For teammate Takagi it was his 13th win in the GT300 class. The order from 3rd place down was determined largely in the pit stops. With the JAF GT cars’ advantage in fuel efficiency, the No. 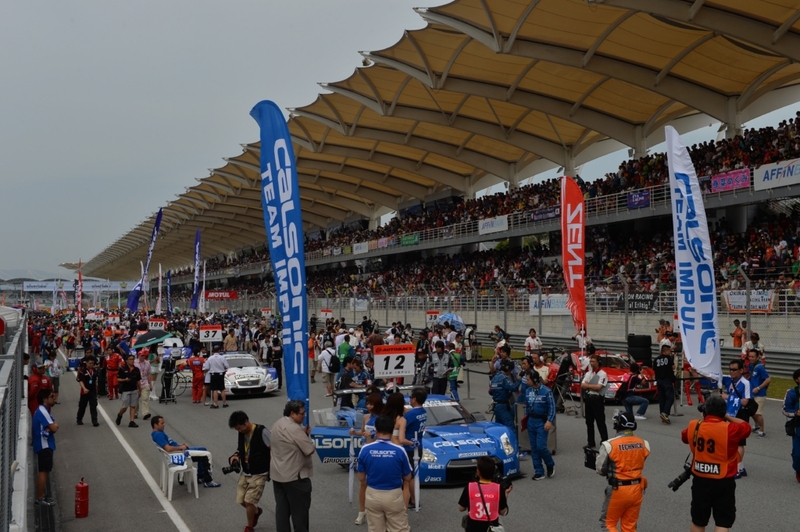 61 SUBARU BRZ R&D SPORT (Tetsuya Yamano) was able to move up to 3rd place. In 4th place came the No. 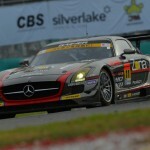 11 GAINER DIXEL SLS (Bjorn Wirdheim＞Katsuyuki Hiranaka), which has better fuel efficiency among the FIA GT3 cars. Following in 5th place was the No. 88 ManePa LAMBORGHINI GT3 (Takayuki Aoki) with its higher fuel consumption rate demanding more refueling time. Perhaps due to the pressure from the pursuing SLS and and Lamborghini machines, Yamano in the BRZ made a mistake while trying to get past some back markers and took a costly spin. However, a quick recovery allowed only the SLS to get past Yamano and he rejoined the race in front of Aoki in the Lamborghini battling to hold 4th position. 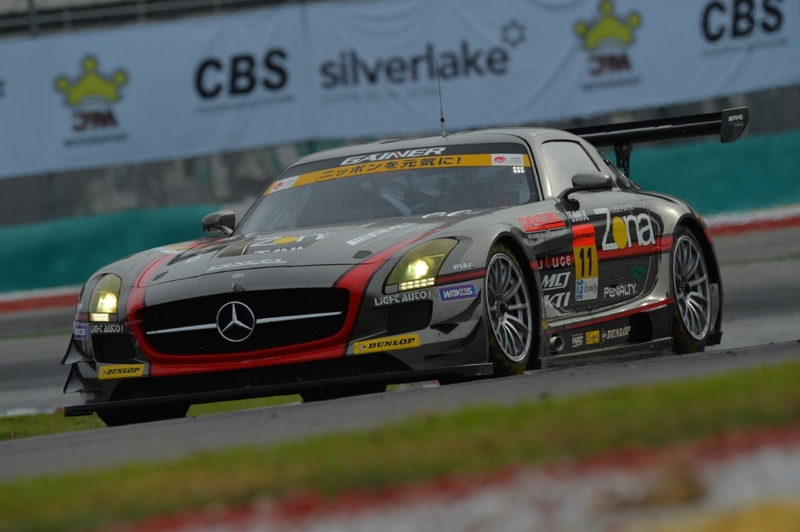 After that, Hiranaka piloted the No.11 GAINER DIXEL SLS on successfully to a podium finish in 3rd place. Aoki in the Lamborghini, who was chasing Yamano in the BRZ, was not so lucky. A malfunction occurred in his cool-suit late in the race and he was unable to hold the pace. This enabled the No. 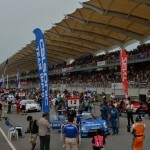 61 SUBARU BRZ R&D SPORT to finish 4th while Aoki in the No.88 ManePa LAMBORGHINI GT3finished 5th. Finishing 6th was the No. 4 GSR HATSUNEMIKU BMW (Tatsuya Kataoka＞Nobuteru Taniguchi) that had managed to move up from a 16th-place start thanks in part to an early pit stop strategy.